More specifically, the huge investments in infrastructure have the potential to ease bottlenecks in cross-border transportation. Among the many benefits of improved connectivity, trade stands out. The idea that improved transport infrastructure should generally foster trade is of course very intuitive. However, it is less sure that such benefits can be spread across countries and, more specifically, which countries stand to win/lose the most depending on their proximity to/distance from the improved infrastructure, among other considerations. In a working paper recently published by Bruegel , we addressed exactly this question by assessing empirically how the belt and road initiative, through a substantial reduction in transportation costs, may foster trade. Beyond the relevance of trade for Europe, our results show that a reduction in transportation cost can indeed increase international trade. A 10 percent reduction in railway, air and maritime costs would increases trade by 2 percent, 5.5 percent and 1.1 percent respectively (see on this scenario and others below). While the current belt and road initiative is centered on building infrastructure, there are other ways in which it may evolve. One obvious objective, as far as trade is concerned, is dismantling trade barriers. In fact, Chinese authorities have started considering free trade agreements (FTA) with the belt and road countries  . Because most of the EU countries are not directly included in the initiative, and it is only possible for China to jointly strike an FTA with all EU countries, the chance for the EU to benefit from an FTA is slim. The previously mentioned Bruegel working paper also develops this scenario by focusing on the impact on EU trade of China-centered free trade bloc among belt and road countries. 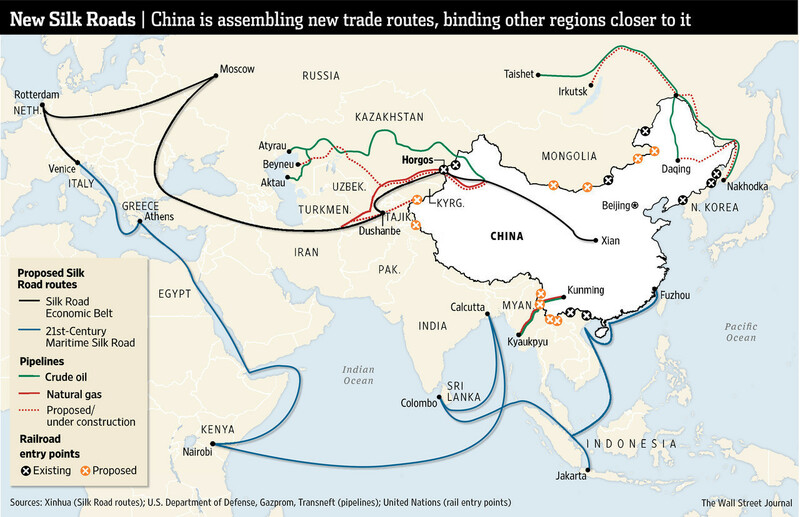 As one could imagine, a scenario where the belt and road initiative focuses on trade barriers is much less appealing than the previous one in which only transport infrastructure is built. In fact, the EU would no longer benefit from a free lunch (we are assuming that China and the belt and road countries will finance the infrastructure and not the EU – indeed, this is the case so far) and would be excluded from a very large free trade area just outside its borders. Ministry of Commerce of China, http://fta.mofcom.gov.cn/article/fzdongtai/201601/30116_1.html .